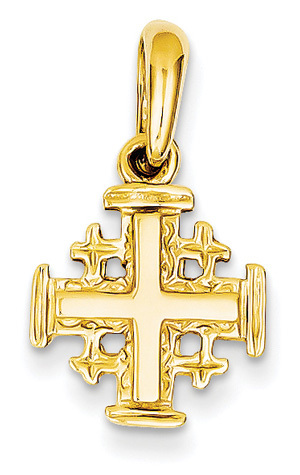 Small Jerusalem cross pendant crafted in fine 14k yellow gold. The Jerusalem Cross consists of the tau cross which represent the Old Testament and four small Greek crosses which symbolize the fulfillment of the law in the Gospels. Cross measures just over 1/2" in size (approx. 7/8" tall with hoop). We guarantee our Small Jerusalem Cross Pendant, 14K Yellow Gold to be high quality, authentic jewelry, as described above.